Ever since I bought my own juicer, I have been converted. Maybe you’ve strayed away from juice from past experiences, or maybe you are turned off from the price. Or maaaaybe you love juice, but have only been purchasing them pre-bottled. Trust me, once you make your own juice it is a religious experience. Now, I know a high-quality juicer is expensive, but remember that the pre-bottled $12 ones add up! Especially if you’re getting them regularly. Before I get on to the recipe, I want t0 touch on some of the benefits of juicing. 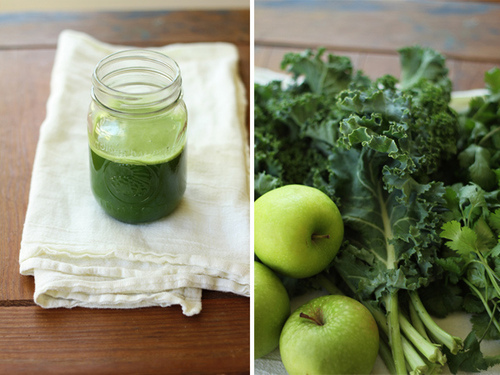 Green juice is all the rage, and for good reason! When you drink juice, highly concentrated vitamins, minerals, and enzymes rapidly enter your bloodstream to be absorbed. Juicing will facilitate weight loss, increased energy, strengthened immunity, strong bones, and glowing skin. So go, drink up! Juice the following ingredients, stir, and don’t forget to serve with ice- this makes it really yummy!